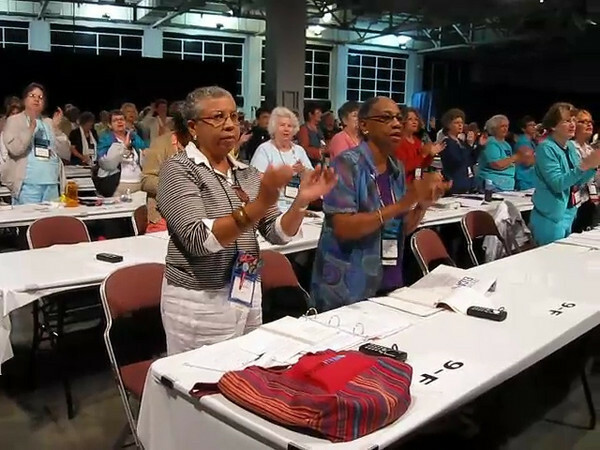 Delegates to the Women of the ELCA Seventh Triennial Convention take a break during a business session July 9 to stretch and sing. More than 380 delegates are meeting in Salt Lake City, Utah, to elect new officers, pass a budget, and respond to memorials and resolutions. The business session precedes a three-day worship experience, Come to the Waters, where more than 2,000 will attend workshops, hear inspirational speakers, study the Bible, and shop in an exhibit area.